Synthesis gas or briefly, syngas, is a mixture of carbon monoxide, carbon dioxide and hydrogen. Syngas can be produced from many sources, including natural gas, coal, biomass, or virtually any hydrocarbon feedstock, by reaction with steam or oxygen. Syngas is a crucial intermediate resource for production of hydrogen, ammonia, methanol, and synthetic hydrocarbon fuels. The formation of syngas is strongly endothermic and requires high temperatures. Steam reforming of natural gas (or shale gas) proceeds in tubular reactors that are heated externally. The process uses nickel catalyst on a special support that is resistant against the harsh process conditions. Waste heat from the oven section is used to preheat gases and to produce steam. This plant generates syngas with H2/CO ratios in the range of 3-4, and is suitable for hydrogen production. Partial oxidation of methane (or hydrocarbons) is a non-catalytic, large-scale process to make syngas and yields syngas with H2/CO ratio of about 2 . This is an optimal ratio for gas-to-liquids plants. A catalytic version of partial oxidation (CPO), based on short-contact time conversion of methane, hydrocarbons or biomass on e.g. rhodium catalysts, is suitable for small-scale applications [5,6]. Autothermal reforming (ATR) is a hybrid, which combines methane steam reforming and oxidation in one process . The heat needed for reforming is generated inside the reactor by oxididation of the feed gas. As POX, ATR is also suitable for large-scale production of syngas for gas-to-liquids or large-scale methanol synthesis processes. Alternative routes to syngas, such as reduction of CO2 from flue gas with H2 from electrolytic splitting of water may become interesting from the viewpoint of storage of wind or solar energy . Synthesis gas (syngas) can be produced from a variety of sources and is a versatile intermediate for production of chemicals and fuels. Gas-to-Liquids (GTL), Coal-to-Liquids (CTL), Biomass-to-Liquids (BTL) all rely on the catalytic conversion of syngas. Reactors and process layout for syngas production from natural gas and shale gas. CO is used as a reductor to shift syngas entirely to H2 (and CO2). The high temperature water gas shift uses iron oxide as a catalyst and proceeds at 300-500 dg.C. A low-temperature process (around 200 dg.C) based on a copper-zinc oxide catalyst drives the equilibrium further towards hydrogen, but requires clean feed gas. Pressure swing adsorption purification leads to high-purity hydrogen . Methanol is a versatile intermediate for the chemical industry, but can also serve as a fuel. Even better is dimethyl ether, applicable as bottle gas for cooking (like camping gas) or as a substitute for diesel fuel. Methanol is also used in the transesterification of vegetable oils to produce biodiesel. Methanol is produced catalytically from a mixture CO2:CO:H2 = 5:5:90, at 50-100 bar and 225-275 dg.C over Cu/ZnO/Al2O3. Copper metal is the catalytically active phase, and ZnO is a chemical and structural promoter, while alumina is only a structural promoter. The Fischer-Tropsch Synthesis (FTS) converts syngas into hydrocarbons which form the basis for gasoline, diesel, jet fuel, and chemicals such as olefins and waxes [12-15]. It forms the heart of the Gas-to-Liquids (GTL) and Coal-to-Liquids (CTL) plants in South Africa, Qatar, Malaysia and China. The product distribution is broader than liquids hydrocarbons alone, and includes methane and alkanes, CnH2n+2 (with n from 1 → 100), alkenes or olefins (CnH2n; n ≥ 2), and to a lesser extent oxygenated products such as alcohols. Catalysts for the Fischer-Tropsch Synthesis are either based on cobalt or the much cheaper iron. In fact, the iron-based catalyst is an iron carbide under reaction conditions, whereas cobalt works in the metallic state. Reaction conditions include temperatures between 200 and 350 dg.C and pressures between 20 and 50 bar. The reactions are exothermic and dealing with the heat is an important issue in the reactor design. This makes Fe-based FTS the preferred option for Coal-to-Liquids technology. CO needs to dissociate before it can convert to hydrocarbons, either directly, or indirectly with the aid of hydrogen. Cobalt and iron readily split the CO bond, and are the preferred catalysts in practice. While cobalt is active as a metal, iron forms carbides in synthesis gas . Alternative mechanisms, for example, in which CO bond breaking is assisted by reaction with hydrogen (Figure 3) [17-20], or chain growth occurs by CO insertion, are available also in the literature, and form a subject of intense discussion. Figure 3 Molecular modeling simulation of CO dissociation on an iron (100) surface (adapted from Elahifard et al. ). 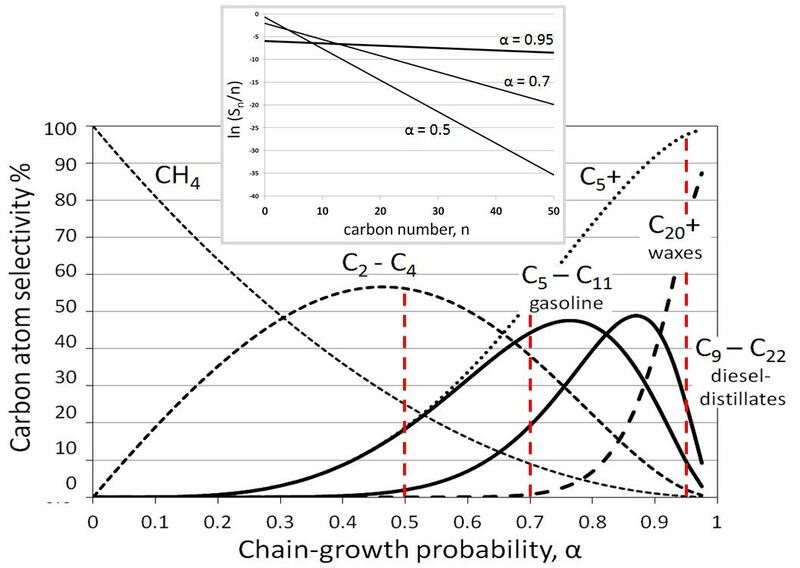 Figure 4	Fischer-Tropsch product distributions in terms of interesting hydrocarbon fractions as a function of the chain-growth , alpha. The insert shows a few Anderson-Schulz-Flory plots according to the logarithmic form. where C stands for the concentration of a hydrocarbon with n carbon atoms and α is the probability that the chain grows. if one plots ln (Sn/n) versus n, see the inset in Figure 4. The ASF distribution describes the product distribution reasonably well, but often the methane yield is higher and the C2 yield lower than predicted, and it is also common to observe a higher chain-growth probability for longer hydrocarbons than for shorter ones . 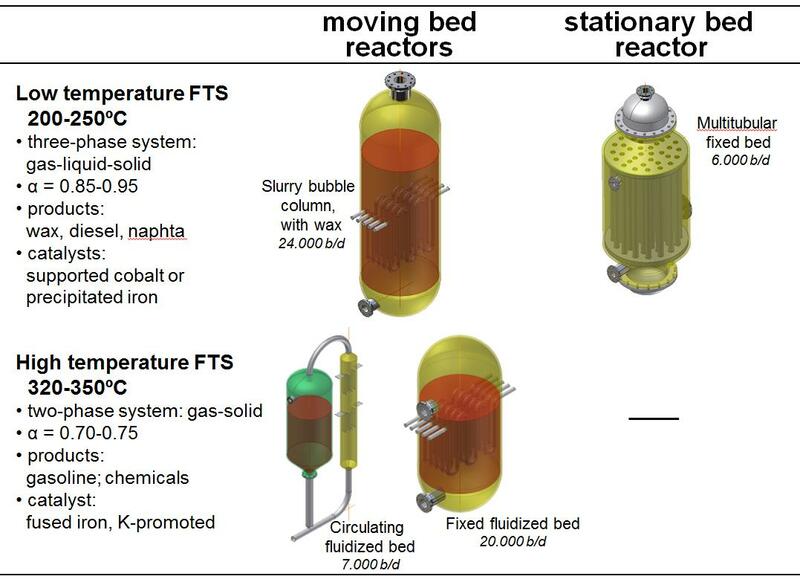 Figure 5 shows the different reactor types that are presently in use, along with process conditions. Low temperature FTS is good for long chains, waxes, and high-temperature for shorter products, i.e. if chemicals and/or gasoline are the desired product [22-25]. LTFT reactors are three-phase systems, with solid catalysts, gaseous reactants, and gaseous and liquid products. LT and MTFT form the basis for the modern GTL and CTL plants. The wax is subsequently hydrocracked to form mostly diesel fuel and some naphta. Both iron and cobalt catalysts can be used for the LTFT processes in CTL and GTL plants [15,23,26]. Iron-based LTFT catalysts contain promoters like potassium and copper as well as a structural modifier such as silica. These catalysts are normally prepared by co-precipitation of the iron and copper elements, followed by impregnation with the potassium and structural promoters. Thereafter, the catalyst has to be shaped for use in either a fixed bed (e.g. extrudates) or a slurry phase FT reactor (e.g. spraydried spheres), followed by calcination. Prior to use in the FT process, the oxidized iron catalysts need to be activated or conditioned in hydrogen or synthesis gas. During the FT process the iron metal is converted to an iron carbide, and depending on the conditions, oxidized again to an iron oxide [27,28]. Figure 5	Overview of Fischer-Tropsch technologies and reactor types used. Fischer-Tropsch synthesis represents proven technology for conversion of gas and coal into synthetic fuels, already since 90 years ago [29,30]. 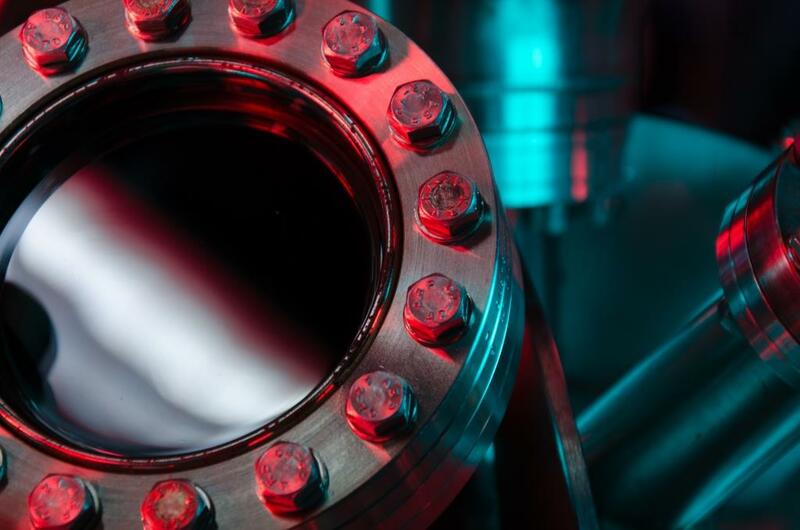 Although much of the scientific research concentrates GTL technology, it is the CTL technology that is expected to see the largest growth in the coming decades. Improvements of the iron-based catalysts are desirable, particularly with respect to better stability and control over selectivity. In fact, scientific understanding of the complex iron-carbon-oxygen phases as they feature in the process, and the relation between catalyst composition and the surface chemistry has still not developed very far beyond insight in highly simplified systems. In this respect the metallic cobalt FTS catalyst is significantly better understood. It is our strong belief, however, that detailed mechanistic insight in iron-based Fischer-Tropsch chemistry is urgently needed to provide a rational basis for improvements in the process. This is the joint mission of Synfuels China Technology Co., Ltd., and Syngaschem BV, in their new laboratory SynCat@Beijing. 2. D.L. Trimm, Coke formation and minimisation during steam reforming reactions, Catalysis Today, 37 (1997) 233-238. 3. H.S. Bengaard, J.K. Norskov, J. Sehested, B.S. Clausen, L.P. Nielsen, A.M. Molenbroek, J.R. Rostrup-Nielsen, Steam reforming and graphite formation on Ni catalysts, Journal of Catalysis, 209 (2002) 365-384. 4. L.W. ter Haar, J.E. Vogel, in: Proceedings of the Sixth World Petroleum Congress, Frankfurt am Main, Germany, 1963. 5. S.S. Bharadwaj, L.D. Schmidt, Catalytic partial oxidation of natural gas to syngas, Fuel Processing Technology, 42 (1995) 109-127. 6. Y.H. Hu, E. Ruckenstein, Catalytic conversion of methane to synthesis gas by partial oxidation and CO2 reforming, Advances in Catalysis, Vol 48, 48 (2004) 297-345. 7. G. Centi, S. Perathoner, Opportunities and prospects in the chemical recycling of carbon dioxide to fuels, Catalysis Today, 148 (2009) 191-205. 8. D.S. Newsome, The water-gas shift reaction, Catalysis Reviews-Science and Engineering, 21 (1980) 275-318. 9. J.N. Armor, The multiple roles for catalysis in the production of H-2, Applied Catalysis a-General, 176 (1999) 159-176. 11. K. Klier, Methanol synthesis, Advances in Catalysis, 31 (1982) 243-313. 12. H. Storch, N. Golumbic, R.B. Anderson, The Fischer-Tropsch and Related Syntheses, Wiley, New york, 1951. 13. E. Iglesia, S.C. Reyes, R.J. Madon, S.L. Soled, Selectivity Control and Catalyst Design in the Fischer-Tropsch Synthesis - Sites, Pellets, and Reactors, Advances in Catalysis, 39 (1993) 221-302. 14. G.P. van der Laan, A.A.C.M. Beenackers, Kinetics and selectivity of the Fischer-Tropsch synthesis: A literature review, Catalysis Reviews-Science and Engineering, 41 (1999) 255-318. 16. M.E. Dry, J.C. Hoogendoorn, Technology of the Fischer-Tropsch Process, Catalysis Reviews-Science and Engineering, 23 (1981) 265-278. 17. P. Biloen, W.M.H. Sachtler, Mechanism of Hydrocarbon Synthesis over Fischer-Tropsch Catalysts, Advances in Catalysis, 30 (1981) 165-216. 19. M. Ojeda, R. Nabar, A.U. Nilekar, A. Ishikawa, M. Mavrikakis, E. Iglesia, CO activation pathways and the mechanism of Fischer-Tropsch synthesis, Journal of Catalysis, 272 (2010) 287-297. 20. M.R. Elahifard, M.Perez-Jigato, J.W. Niemantsverdriet, Direct versus Hydrogen-Assisted CO Dissociation on the Fe(100) Surface: a DFT Study, Chem Phys Chem 13 (2012) 89-91. 21. T.J. Donnelly, I.C. Yates, C.N. Satterfield, Analysis and Prediction of Product Distributions of the Fischer-Tropsch Synthesis, Energy & Fuels, 2 (1988) 734-739. 22. A.P. Steynberg, R.L. Espinoza, B. Jager, A.C. Vosloo, High temperature Fischer-Tropsch synthesis in commercial practice, Applied Catalysis a-General, 186 (1999) 41-54. 23. R.L. Espinoza, A.P. Steynberg, B. Jager, A.C. Vosloo, Low temperature Fischer-Tropsch synthesis from a Sasol perspective, Applied Catalysis a-General, 186 (1999) 13-26. 24. J.J.C. Geerlings, J.H. Wilson, G.J. Kramer, H. Kuipers, A. Hoek, H.M. Huisman, Fischer-Tropsch technology - from active site to commercial process, Applied Catalysis a-General, 186 (1999) 27-40. 25. S.T. Sie, Process development and scale up: IV. Case history of the development of a Fischer-Tropsch synthesis process, Reviews in Chemical Engineering, 14 (1998) 109-157. 26. B.H. Davis, Fischer-Tropsch synthesis: relationship between iron catalyst composition and process variables, Catalysis Today, 84 (2003) 83-98. 27. J.W. Niemantsverdriet, A.M. Van der Kraan, W.L. Van Dijk, H.S. Van der Baan, Behavior of Metallic Iron Catalysts During Fischer-Tropsch Synthesis Studied with Mossbauer-Spectroscopy, X-Ray-Diffraction, Carbon Content Determination, and Reaction Kinetic Measurements, Journal of Physical Chemistry, 84 (1980) 3363-3370. 28. E. de Smit, B.M. Weckhuysen, The renaissance of iron-based Fischer-Tropsch synthesis: on the multifaceted catalyst deactivation behaviour, Chemical Society Reviews, 37 (2008) 2758-2781. 29. F. Fischer, H. Tropsch, The preparation of synthetic oil mixtures (synthol) from carbon monoxide and hydrogen, Brennst. Chem., 4 (1923) 276-285. 30. F. Fischer, H. Tropsch, The synthesis of petroleum at atmospheric pressures from gasification products of coal, Brennst. Chem., 7 (1926) 97-104.